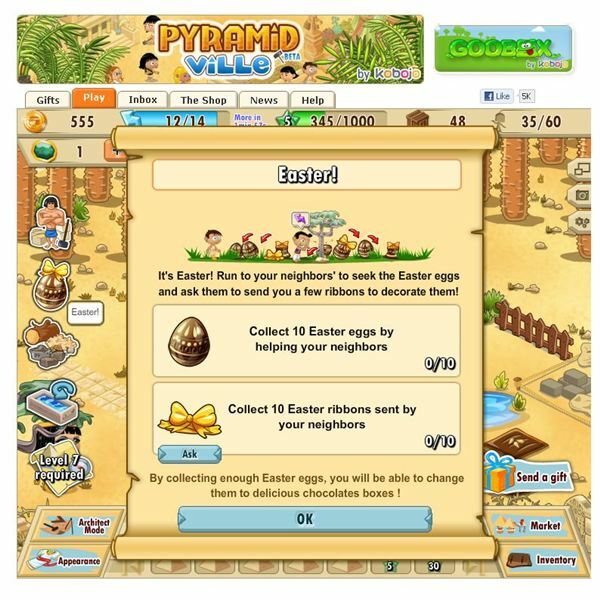 With PyramidVille, you start in the Egyptian desert and turn a small village into a thriving city. Build small huts, worker housing, and eventually palaces. 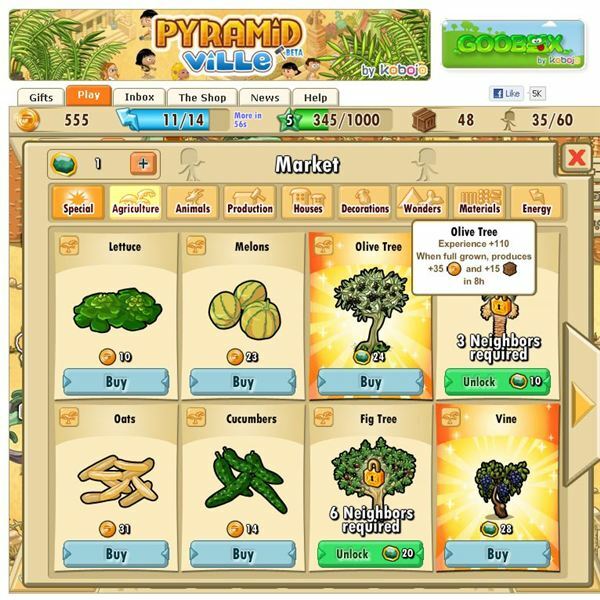 Collect various resources such as wood, clay, metal, and diamonds. Farm the land and grow crops such as lettuce, melons, date palms, olive trees, and cucumbers. Decorate your land with various items to make it your own. The game uses the standard energy system found in many Facebook games. You’ll use energy points as you build things in PyramidVille. Other game options include the need to feed your people and collect taxes from your homes. Visit your Neighbors to view their cities and complete quests fro experience and rewards in the game. PyramidVille started in French but it now has an English version. 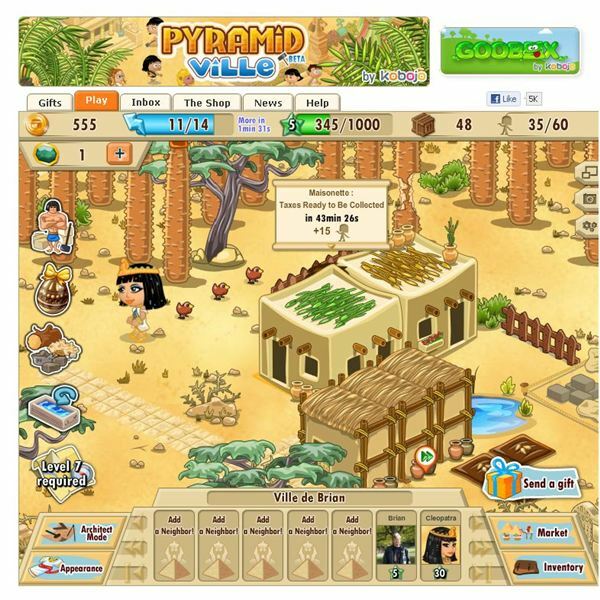 The game is similar to many of the city builders on Facebook except it has an Egyptian theme to it. Click on the marketplace to add new structures and items to your city. You will need to start with homes to raise your population levels and then you can build economic structures such as lumber mills. You’ll need to acquire parts from Facebook friends to complete many of the structures in the game. The land needs to be cleared before you can build on it so you’ll use energy points to remove trees, rocks, and other debris from the area where you want your buildings to go. The need to clear land gives you a sense that you are actually building a city from scratch. The game features an architect mode where you can freely move structures and rotate them. The marketplace has a great selection of structures for your growing city and even a few wonders at higher levels. It takes game time for your structures to complete once you place them on the map. You’ll spend time between structure creation, farming, and collecting items from your humble city. PyramidVille has enough content to keep you interested. There’s quite a few structures already in the game. You can farm for food that is supplied to your people. You need population to grow your city just like a regular city and you need to collect resources in the game just as you did in ancient Egypt. There’s a lot of clicking in the game to collect taxes and supply food to your people but this is standard for most Facebook city builders. The quests in PyramidVille are good and they help you learn about the game and give you some nice rewards for completing them. The game has a nice economic side to it where you make different resources such as wood planks from your sawmill or produce some clay. These economic buildings are your businesses in the game. The game has a decent soundtrack with an Egyptian feel to it. There are other various sounds in the game as you play. The graphics in the game are quite good and each building looks nice but don’t expect a lot of detail. The game does load quickly and there are no slowdowns in the game play as you build things. Overall, the graphics are pretty average looking for a Facebook game and what you would expect. PyramidVille features an average interface. You will find a market button where you can buy your structures and place them on the map. Your inventory button stores your resources and extra food that you acquire from playing the game. You can sort your inventory by materials, objects or energy to find your items. The game features basic multiplayer options where you can send gifts or visit neighbors for some rewards. You need some neighbors to send you parts so you can complete some of the structures in the game. 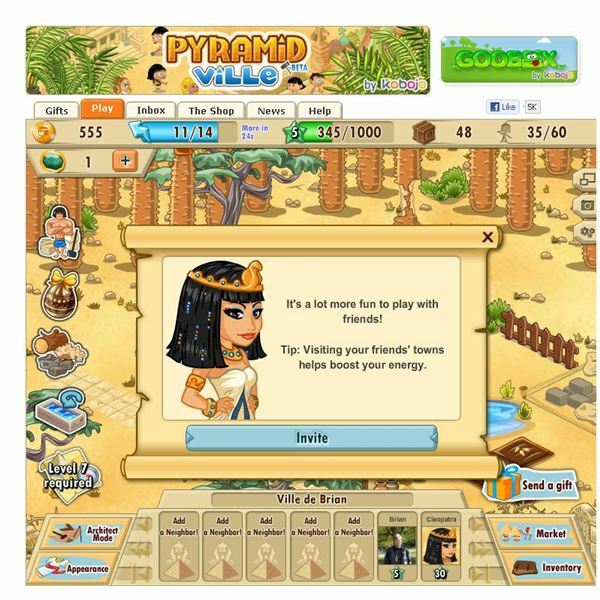 PyramidVille is an average Facebook city builder but it is still fun to play if you like ancient Egypt. The selection of structures is nice and you can farm for food as well as collect resources. You need to clear land, which makes it feel like your building too. PyramidVille is worth playing but expect to have an average experience on par with the other Facebook city building games available on the site. Source: Article is author's own experiences playing PyramidVille on Facebook.